The origins of the Old Cross are unclear. It’s unclear if it were even a cross – sepculation suggests that it may have been a seventeenth century sundial. It has an unusual head – consisting of a polygonal piece of stone with concave sockets in three faces. 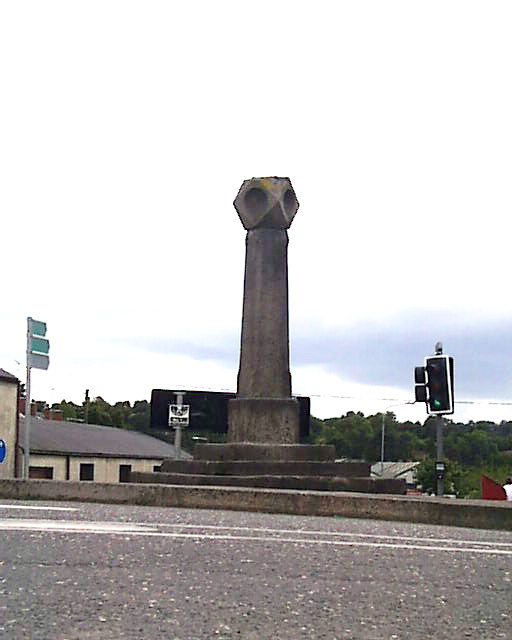 It was originally in the Diamond and used as a hiring cross and for the attaching of proclamations but was moved to the Shambles (now Old Cross Square) to allow for the construction of the Rossmore Memorial in the late 19th century. In late 2010 it was moved again, this time to facilitate traffic re-organisation. In its new location, the full steps can be now seen where before they were semi-buried by a traffic island.